Audiences, where would we be without them? Now that audiences are using multiple screens, what are they doing on their phone while they watch TV? How can we accurately measure their activity? 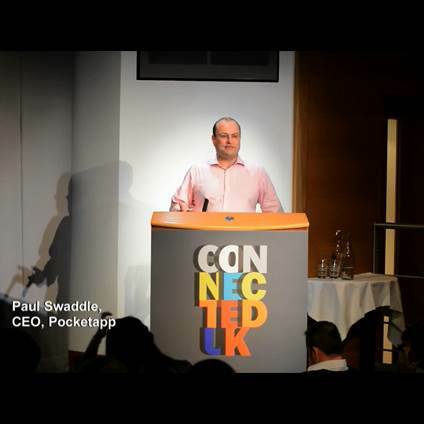 Paul Swaddle, CEO, Pocket App answered these questions and many more during the recent ConnectedUK event that took place on the 22nd May. Paul also discussed the developments in dual screen consumption including how the rise of the tablet is changing the way viewers interact and consume media and what this will ultimately mean for traditional TV viewing. ConnectedUK is a series of four events that will bring together leading figures from the worlds of TV, video games, digital media and advertising to explore different themes of possible collaboration in the connected content space. They showcase ideas, innovations and good practice for what could become the next big market for content. The events will bring together over 800 producers, agencies and developers to hear the latest thinking and experience from the converged media landscape. If you would like to attend future ConectedUK events and catch up with the Pocket App team, please register your attendance here.